Indian Railways once again revised earlier announced refund rule from 12th November 2015 ( 12 – 11 – 2015 ). This time IRCTC or Indian Railways modifies the fares to reduce the misuse of unauthorized fraud ticket booking blocking of ticket by different persons happening now a days. Another motivation to change this time fare is to Make use of Paper Less ticket or Mobile ticketing popularity increase. Hope this changes will make remarkable impact on Ticket Black Market discourage. Revised rule from July 2015 Automatic refund of fare on e-tickets implemented when Train Cancelled. Cancellation charge per passenger confirmed (reserved) tickets (i). 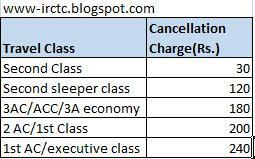 48 hours before the scheduled departure of the train minimum cancellation charge (a) 1st AC/executive class: Rs. 240 (b)2 AC/1st Class : Rs. 200 (c) 3AC / ACC / 3A economy: Rs. 180 (d) Second sleeper class : Rs. 120 (e)Second class : Rs. 60 (ii). Between 48 hours and 12 hours before the scheduled departure of the train @ 25% subject to minimum charge as per (i) above. (iii) between 12 hours and 4 hours before the scheduled departure of the train @ 50% subject to minimum charges per (i) above. (iv) No refund after the above prescribed time limit. Partially confirmed Tickets: Up to half an hour before the scheduled departure of the train. Earlier this is Up to two hours after the actual departure of the train. Refund on unused RAC/WL tickets Cancellation: Up to half an hour before the scheduled departure of the train subject to deduction of clerk-age charge. No refund after the above prescribed time limit. Earlier this is Up to 3 hours of the actual departure of the train subject to deduction in clerk-age charge. No refund after the above prescribed time limit. Cancellation of trains for e tickets: With effective from 01.07.2015, automatic refund is granted. Filing of TDR is not required. No change for counter PRS ticket. Before this user have to manually file the TDR to get the refund amount. Now its so easy and getting refund on less time when trains cancelled. No refund is permissible against lost/misplaced tickets. However passenger will be allowed to travel on the reservation already made on confirmed one or RAC .If the loss of confirmed/RAC ticket is reported before the preparation of the reservation chart, duplicate ticket will be issued on the collection of the clerkage charge per passenger. If the loss of confirmed/RAC ticket is reported after the preparation of the reservation chart, duplicate ticket will be issued on the collection of the 50% of the fare . No duplicate ticket will be issued after the preparation of reservation chart in case of RAC ticket . Loss of tickets be reported to railways immediately to prevent fraudulent refunds on lost tickets. If lost tickets are traced and presented along with the duplicate ticket before the departure of the train, refund is permitted for the duplicate ticket after deduction of 5% of the charges paid subject to a min. of Rs. 20/-. Thereafter, original ticket becomes valid for travel as well as refunds. Tickets purchased on credit cards can be cancelled and Credit Slip obtained only at such Railway Stations where Credit Card counters exist. As per new rule IRCTC provides 50 percentage Cash back / refund facility for the Cancellation of Tickets. This considers to be a good move and can encourage more users to purchase the Tatkal Ticket. AC (Air Conditioned) compartments tatkal booking time now start on the same time but will end on after 1 hour. That is new AC tatkal timing is 10 AM to 11 AM only. Earlier this not having any limits but other class passengers also booking at the same time. So heavy load occur and lots of people not getting ticket on both Railway Stations booking area as well as online IRCTC Booking websites. Hope this move will reduce the load. All types of ticket booking agents like Yatri Ticket Suvidha Kendra-YTSK, Rail Travelers Service Agents-RTSAs, IRCTC agents etc. are blocked from booking tickets during the first 30 minutes of opening of advance reservation booking. That is from 08:00 AM to 08:30 AM for General bookings, from 10:00 AM to 10:30 AM for Tatkal AC tickets booking and from 11:00 AM to 11:30 AM for Tatkal Non-AC bookings. Indian Railways announced that have extended the timings of IRCTC Online Ticket booking time by 15 Minutes for the convince of the passengers. As per revised rule users can able to book the IRCTC / Indian Railways ticket from 12:30 AM to 11: 45 PM every day. This change will applicable from September 20, 2015. Earlier can able to book the IRCTC ticket only between 12:30 AM to 11: 30 PM only. Indian Railway stations reservations ticket booking counters also will work as per revised rule. So Indian railways ticket booking will shut down for maintenance only for short time of 45 Minutes only. Send your claim for refund to the following address attaching the original copy of the TDR to: General Manager (Operations), Indian Railway Catering & Tourism, Corporation Ltd., 2nd Floor, STC Building, 1, Tolstoy Marg, New Delhi – 110 001. In case train is running late more than 3 hrs- full fare will be refunded. a) In case of AC failure of AC1class/Executive class- Difference of fare between AC1class orExecutive class and First Class will be refunded for the distance AC not worked. Certificatefrom the TTE (in original) for the AC not worked is must to claim for refund. b) In case of AC failure of AC2/AC3 class- Difference of fare between AC2/AC3 class and Sleeper Class will be refunded for the distance AC not worked. Certificate from the TTE (in original) for the AC not worked is must to claim for refund. c) In case of AC failure of AC chair car class- Difference of fare between AC chair car class and second class will be refunded for the distance AC not worked. Certificate from the TTE (in original) for the AC not worked is must to claim for refund. In case Travelling without proper ID proof-will be considered without ticket and will be charged accordingly. Chief Commercial Manager/Refunds can be approached for discretionary refund. Excess fare ticket (EFT) (in original) issued by the TTE is must to claim for refund. In case passenger not travelled- refund will be granted by the Chief Commercial Manager/Refunds as per extant Railway rule. Partially used reserved ticket by Rajdhani, Shatabdi and Jan Shatabadi Exp- No refund is allowed. Refund on Tatkal Ticket- if it is cancelled up to 24 hrs before the scheduled departure of the train 25% excluding the Tatkal charges will be refunded. Thereafter no refund means would be zero refund. General Manager (Operations),Indian Railway Catering & Tourism, Corporation Ltd.,2nd Floor, STC Building,1, Tolstoy Marg,New Delhi – 110 001.